Paper jams are an unfortunate part of working in an office. No matter how advanced your machine is, there is no way to completely guarantee that your copier won’t jam up at least once. It’s times like these that you should know how to get yourself out of trouble. Paper jams are actually very easy to fix. 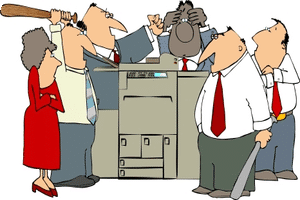 Don’t be concerned that your copier is an advanced piece of technology. Anyone can fix a paper jam if they are careful, and pay attention to what they are doing. Paper jams are a basic problem, but if you aren’t careful then you can cause big issues that will require a technician to fix. But don’t be scared! Just follow these simple steps and you will be on your way to fixing a paper jam. Find the Jam. Look inside the paper tray for the source of the problem. If you cannot find the problem in the paper tray then you may need to open up your machine. Remove the jam. The most important thing to remember is that you need to remove it gently. Yanking on the paper can cause problems, or make the paper rip. Double check your copier. Make sure you truly removed all sourced of the problem. Check to see that there are no torn pieces of paper left inside that could cause trouble. Run a cleaning program. This will make sure that any tiny scraps are cleared out, along with any dust. If you follow these steps then you should be out of trouble in no time. Paper jams will happen, so it’s important to know what to do if it happens to you. If you followed these steps but you still can’t figure out what the problem is then it may be time to call the experts at Fort Collins Copier.